As usual, Democrats are right to complain… and they are doing it all wrong. President Trump declared a commission aimed at justifying his unfounded voter fraud claims. (“Millions cast illegal ballots, giving Hillary Clinton her huge popular vote margin.”) But instead of appointing a blue-ribbon, bipartisan committee of nationally respected sages, the commission will be spearheaded by Vice President Mike Pence and Kansas Secretary of State Kris Kobach, often tied to white nationalists. Riiight. Go to Kansas - by far the worst governed state in the Union - for wisdom. I'll get back to that, later. (1) There is no factual evidence that this is a major problem requiring urgent-rapid action. Voter fraud has repeatedly been shown to be almost nonexistent. (2) Other forms of cheating are either blatant -- gerrymandering -- or seem extremely likely - e.g. many red states use voting machines that cannot be audited and are made by known-rabid rightwing partisans. (3) There is a simple test as to whether red state GOP legislators pushing voter ID laws are sincere, or attempting bald-faced suppression of US citizens exercising their rights. What is that simple test? When red states pass these restrictions, do they also allocate money for compliance assistance? Whenever the federal government – or most states – apply new regs upon business, there is almost always some provision offering those businesses help in complying with the new regs. Sometimes the help is modest, often it is substantial. But the principle is well-established. Moreover, if a new regulation’s impact hits small fry hard – like mom and pop establishments – then the calls for compliance assistance are compelling! So, here’s the simple test. Have any of the GOP-led state legislatures who passed stiff voter ID laws also alloted funds to help poor citizens to get the IDs they need? It's a win-win, since getting clear ID will also help poor folks to do banking, establish businesses and lift themselves out of poverty. A concerted effort to help a state’s citizens get ID would be both beneficial and prove that those legislatures were sincere. It would refute the accusation that these laws have one sole purpose – cheating. Okay, here’s the crux. The on-off switch. The total fact that proves criminality and treason. Not one of these red states have passed even a single penny of compliance assistance, to accompany a stiff, new regulatory burden they slapped on their poorest and most vulnerable citizens. In fact, many of these red – no, they must be called gray – states went on a binge of closing DMV offices “to save money,” mostly in poor or democratic-leaning counties. They made compliance with their own law harder. Deliberately much harder. Hence the indictment is proved. As it is with the utterly laughable-hypocritical “commission” that Donald Trump just appointed. They are exposed as liars. Cheaters. Betrayers. Hypocrites and traitors. Confederates. "What is interesting is that whereas Mr. Trump was elected (partly) because he promised to improve the condition of the American worker, since his election, the 0.1% have gained the most as the stock market capitalization has increased by over $2 trillion. 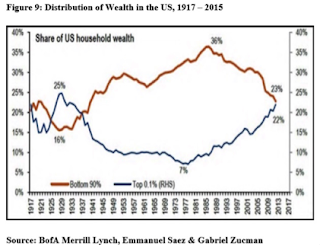 Therefore, by now the wealth of the top 0.1% should exceed the wealth of the bottom 90% for the first time since 1941. Remarkably, the recent pronouncements by Trump and coterie suggest that they equate the stock market strength with a strong economy as well…." 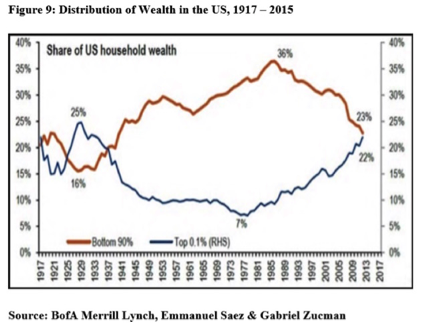 Notice how the blue line started surging upward, in tandem with the red line's fall, with the arrival of Ronald Reagan's tax cuts on passive capital gains. Tell me. Do you actually think the crushed middle class will continue to drink the plantation lords' koolaid -- the soothing rhetoric that the beneficiaries of this trend aren't the ones to blame for it? Lifespan disparities among the races have been narrowing (in the U.S.). Good news... though that may change. 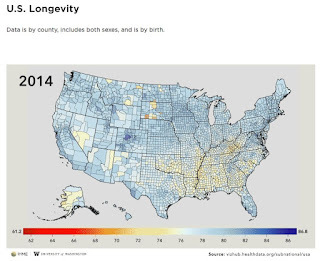 Meanwhile, lifespan disparities have been increasing geographically. Look at the map. Now squint and correlate it with our red-blue divide. Several observations: (1) Appalachia and the Olde South got huge help from FDR, then Kennedy and Johnson, and these disparities declined. (2) They started climbing again directly after the arrival of Nixon-Reagan and the installation of GOP governments in those states. There is something called Outcomes Correlation. When outcomes so clearly correlate with policies, that doesn't prove the policies were responsible for the outcomes. But it does create that presumption. It shifts the burden of proof onto those who hold otherwise. In this case, the correlation suggests that citizens of these states should recall why their parents adored FDR and Kennedy and Johnson. It suggests that they have been very badly governed by their GOP state leaders, whose confederate policies (favoring rich plantation lords) might be discredited compared to policies that show blue states doing ever-better. Outcomes appraisal should "trump" left-right dogmas or identity-populism. Outcomes appraisal is a sign that you are sapient, capable of examining what's in your self- interest. What's in your outcomes-correlated self-interest? To never trust a Republican Politician with a burnt match, ever, ever again. See outcomes appraised in some detail, if you dare: Do outcomes matter more than rhetoric? Oh, I promised a further thought about Dorothy's home state. Almost hidden in the announcement of a $110 billion arms sale to Saudi Arabia -- in which Trump treasonously swore to help the sheiks and princes 'get a great deal' from U.S. companies -- is a small matter of industrial shift. Using Saudi money as a cudgel, Trump coerced agreement from Boeing, Lockheed etc to move production from blue states to red ones, at least partially, with Kansas the biggest beneficiary. Sure, this is partly just more mean-minded politics. While Democrats in power sent heaps of blue state generated money (and NASA centers) into Appalachia and the South as part of anti poverty programs, Republicans push cash flows in the same direction as a matter of pure spite and vengeance, with California and New York special targets. But there's a particular reason to single out Kansas for this latest huge largesse. You see, under Sam Brownback, the GOP-led state government there doubled down on "Supply Side (voodoo) Economics," slashing taxes on the rich while chopping services for the middle class and poor. The theory posits that giving gushers of gifts to the aristocracy will stimulate economic activity so much that it will erase deficits. In fact, SSVE has never worked. Once. Ever. At all. Anywhere or at any time. Sure enough, Kansas is now drowning in debt, bankruptcies, ruined schools and collapsing infrastructure. KS voters punished the GOP in the last election, but nowhere near as much as seems likely, next time. Worse yet for the plantation lords, the Kansas economic collapse is so stark that maybe, at long last, a large majority of Americans will get riled up and thoroughly smash the trickle-down insanity. The lords' hope - underlying the Saudi Arms Deal - is that transferring production from Washington State and California to Kansas will federally prop up the latter state's disaster enough to keep the delusion going for just a while longer. And now you understand the insidious sub-text, beneath the news. I’ll happily offer up moments when I don’t disagree with President Trump. (In part because it maintains my credibility to oppose his many deficiencies.) Two of these are found in his admiration for some Canadian policies. For example, he recently spoke positively of Canada’s single-payer healthcare system. Which we are are now more likely to get, since the recently passed GOP “Obamacare replacement” will explode in short order. Another is in the under-discussed matter of LEGAL immigration, which has far greater effects than the infamously transfixing topic of undocumented incomers. The family reunification system, set up by the democrats, is horrible. Oh sure, it sounds nicely moral and goody-goody and I support reuniting parents and children and young siblings. But beyond that, it is actually deeply immoral, giving advantage to people in the “home country” who are already way luckier than their neighbors, by having American cousins who send money and advantages. This luck advantage is wretchedly indefensible and has no justification at all. Why not let in folks who can adapt to US society swiftly and productively, giving us a win-win? Can you think of any better way to keep us rich and diverse and vibrant -- and rich -- enough to keep being generous in the world and letting in more? * People are prank calling President Trump's new office to report illegal "criminal aliens" — just not the type of "aliens" President Trump had in mind when he created the office. * An elder thought: I do wonder if I am the only person on the planet who remembers how, in the 60s and early 70s, there were economists hand wringing a worry that seems utterly weird, today. At then-present rates, if all the pension plans were fully vested, then by 2010 the workers would - through those pension plans - "own the means of production." They would own the factories and have the largest share of stock equity. Then came wave after wave of refusal to vest the pension funds... and the 'problem' is now entirely forgotten! I can't even get economists my age, like John Mauldin, to remember this. They get uncomfortable and change the subject. Do any of you remember it, at all? With citations? * When was America great? I have eviscerated the confeds’ first, reflex answer — the 1950s of “Happy Days” — is easy to refute. But then, romantic nostalgists are adaptable. As they keep moving the goal posts on climate change, they will shift when they say American greatness peaked. Though this article shows how even the first billionaire, in 1916, lived in many ways worse than most middle class Americans of 2017. Romantic nostalgia is an ancient poison, as described in this interesting piece. “How Nostalgia Made America Great Again.” See my takedown of 1950s nostalgia here. The Greatest Generation - of that era - wanted desperately to make a better world... and they succeeded. Anybody who wants to go back to the 1950s insults the great men and women who lived and strived and worked then! * A meme warfare unit? A hilarious spoof that ought to be true!